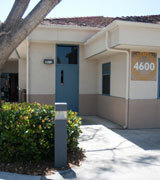 Most MAT classes are held in the Digital Media Center on the Oceanside campus (OC4600). It is a multi-disciplinary facility that houses three instructional computer classrooms equipped with data projectors, multi-format video projection sytems and computer equipment, printers, scanners, and other support hardware, as well as several ancillary spaces. 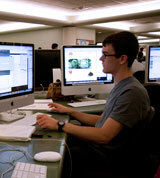 There is a dedicated Macintosh classroom (4622), a dedicated PC classroom (4607), and a cross-platform (Mac / PC) classroom (4610), providing students with access to every major platform and software version currently used in the field. We also have a dedicated video edit bay. 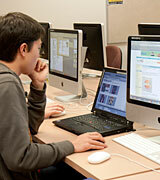 Every effort is made to ensure that students have access to the latest software and hardware used in the industry. The computers and software in the classrooms are regularly updated to remain on the cutting-edge and reflect industry standards.